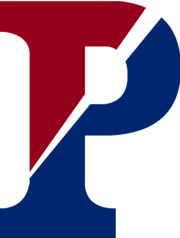 The Penn Quakers football team is the college football team at the University of Pennsylvania in Philadelphia, Pennsylvania. The Penn Quakers have competed in the Ivy League since its inaugural season of 1956, and are currently a Division I Football Championship Subdivision (FCS) member of the National Collegiate Athletic Association (NCAA). Penn has played in 1,364 football games, the most of any school in any division. Penn plays its home games at historic Franklin Field, the oldest stadium in football. All Penn games are broadcast on WNTP or WFIL radio. NCAA record for most college football games played - 1,364. Longest Ivy League winning streak - 20 straight games (2001–2004). Penn also holds the next two Longest Ivy League win streaks. (18 straight games - 2008-2011) and (17 straight games - 1992-1995). George H. Brooke - Twice All-America, College football Hall of Fame. Alden Knipe - All-America, led team to 1894 national championship. Eighteen former players have been inducted into the College Football Hall of Fame. A total of 51 players from Penn have been drafted in the NFL, including NFL Hall of Famers Chuck Bednarik (#1 overall pick in 1949) and Bert Bell (1963) and NFL first-round pick Skip Minisi. Penn's rivalry with Cornell is the 5th-most played college football rivalry of all time, as the two have met 123 times. Their first game was in 1893 and have played every year since, except in 1918. Penn leads in the series, 72–46–5. Since the official formation of the Ivy League in 1956 Penn has won 31 games and Cornell has won 29 games. There was one tie (1974). Since 1982 Penn has won 24 games and Cornell has won 11 games. The winner is awarded the Trustee's Cup. Penn has won 15 times and Cornell has won 7 times since the Trustees Cup was first awarded in 1995. Although Penn's rivalry with Princeton is primarily in basketball, the two also have a historic and intense football rivalry dating back to 1876. It is the 5th oldest football rivalry in the Ivy League. Princeton was Penn's first opponent in football and they have played 108 times. Princeton won the first 28 games in this series but after Penn defeated Princeton in 1892 (6–4) and again in 1894 (12–0) the contest was suspended until 1935. Since the resumption Penn has won 40 games and Princeton has won 36 games. There has been one tie (1942). Since the official formation of the Ivy League in 1956 Princeton has won 31 games and Penn has won 30 games, but since 1982 however, Penn has defeated Princeton 23 times and Princeton has defeated Penn in 12 games. Beginning in 2018 Penn and Princeton will play each other in their final game adding to the intensity between these neighboring Ivy League archrivals. Penn's rivalry with Yale dates back to 1879. These two Ivy League universities have very historic football traditions. Yale defeated Penn 12 straight times between 1879 and 1893. The series was stopped and not resumed until 1925. After Penn defeated Yale at the Bowl that year, 16-13, the series was stopped again for nine years. When it was resumed for a second time in 1934 Yale won the first 4 contests but Penn came back to defeat Yale in the next 9 out of 10 games. The series since 1925 has been very closely fought with Penn victorious 36 times and Yale winning 35 times. There has been one tie (1977) in the 84 games played. Since 1982 however, Penn has defeated Yale in 25 games and Yale has won 10 games. Since Brown's ascent to a perennial contender in the Ivy League in the late 1990s, the Penn-Brown game (first played in 1895) has had massive implications towards deciding the champion each year. The Quakers and Bears play at a pivotal time each year; the teams face off with just three games remaining on the Ivy League schedule, and both are typically still in the title hunt, leading to a hard-fought battle. Penn has a commanding lead in this 85 game series with Brown, 59–24–2. Since the official formation of the Ivy League in 1956 Penn leads Brown 39 victories to Brown's 21 victories with one tie (1983). Since 1982 Penn has won 23 games and Brown 11 games with the one tie. However, in the last 21 games played since 1996, Penn has won 11 games and Brown has won 10 games. Penn's rivalry with Harvard dates back to 1881. In the first 18 games played in this 86 game series Harvard won 13 games to Penn's 5 victories. By 1958 Penn pulled even at 14 wins for each with one tie (1940). From 1959 through 1981 Harvard dominated the series winning 20 games to Penn's 2 victories (1963 and 1972). There was one tie (1965). However, in recent years, the Penn-Harvard football game in mid-November has usually had Ivy League Football Championship connotations. Since 1982 Penn and Harvard have won the Ivy League Football Championship 30 times between them. Penn (17) and Harvard (13). Penn has been undefeated 8 times in the Ivy League and Harvard 6 times during that span. Since 1982 Penn has won 21 games against Harvard and Harvard has won 14 games against Penn. In 2015 Penn ended Harvard's 17 game Ivy League win streak and their 22-game overall win streak when they defeated the Crimson at Harvard, 35–25. In 2016 Penn again defeated Harvard at Franklin Field, 27-14, ending the Crimson's 13 game Ivy road win streak. Since 2007 Harvard has won 60 Ivy League contests and lost 10 Ivy League contests. Of the 10 games the Crimson has lost, 5 of Harvard's defeats were to Penn. Penn's rivalry with Dartmouth dates back to 1896. Penn leads in the 84 games played with 48 victories to 34 defeats. There has been 2 ties, (1916 and 1921). For most of the 84 games played Dartmouth has been Penn's first Ivy League contest of the season. Since the official formation of the Ivy League in 1956 Penn has won 33 games and Dartmouth has won 28 games. Since 1982 Penn has won 27 games and Dartmouth has won 8 games. Penn's 2nd oldest Ivy League football rival is Columbia. The Penn-Columbia rivalry began in 1878. It has been played 96 times with Penn holding a commanding lead in this series, 74 wins to 21 losses. There has been 1 tie ( 1878). Since the official formation of the Ivy League in 1956 Penn has won 45 contests and lost 16 contests. Since 1982 Penn has won 32 games and lost only 3 games. One of those Columbia victories (1995) however broke Penn's 24-game win streak, an Ivy League record for consecutive victories. Penn is currently on a 20-game win streak against Columbia, the longest against an annual opponent in the FCS. Penn and Lafayette have played 90 games since their first meeting in 1882. Penn leads in the series 63-23–4. The Penn-Lafayette rivalry was one of the most fierce contests in college football during the late 19th century, most notably the 1896 contest. In that game, Lafayette upset Penn 6–4, and eventually was named national champion, the first non-Ivy to win a national championship. In the last 15 games played since 1990 Penn has won 8 contests and Lafayette has won 7 games. Lafayette is one of Penn's primary non-Ivy games and will resume their series in 2019. Lehigh is also one of Penn's oldest opponents. They began playing football in 1885. In the 59 games played Penn has won 44 and Lehigh has won 15. In the last ten meetings dating back to 1982 however, Lehigh has won 7 games and Penn has won 3 games. Bucknell and Penn first met in 1895. Penn leads in this non-conference series 29 wins to 5 losses. Since 1982 Penn has won 13 games and Bucknell has won 3 games. The last time these schools met was in 2010. Penn has won the last 6 games played. The Penn-Bucknell series will resume in 2018. On November 13, 1982, Penn defeated Harvard 23–21 at Franklin Field. With this win, Penn clinched the Ivy League conference championship for 1982, their first in 23 years. Penn kicked a field goal in the last seconds to win. After a first field goal kick missed, a flag gave Penn a second attempt which they converted. On November 10, 1984, Penn defeated Harvard 38–7 at Franklin Field. 38,000 fans showed up to support Penn as they clinched a third straight Ivy League title. Head coach Jerry Berndt was named Ivy League Coach of the Year in large part because of this game. On October 18, 1986, Penn defeated Navy 30–26 in front of Navy's Homecoming crowd. Penn finished the season undefeated at 10–0, 6–0 in the Ivy League for their 5th straight Ivy League title. On November 20, 1993, Penn defeated Cornell 17–14 at Franklin Field. Penn was 9–0, 6–0 in the Ivy League coming into the game needing a victory to win the Ivy League and preserve an undefeated season. Cornell led 14–0 at halftime, but Penn did not let their rival score in the second half and won by a field goal. On November 19, 1994, Penn defeated Cornell 18–14 at Schoellkopf Field. Penn was 8–0, 6–0 in the Ivy League coming into the game for the second year in the row undefeated and needing to win to clinch an Ivy League title. Penn won a close road game over their chief rival to have back-to-back undefeated seasons. On November 16, 2002, Penn defeated Harvard 44–9 at Franklin Field. With this win, Penn clinched the Ivy League conference championship for 2002. This game was the site of ESPN's College Gameday program (the first time a FCS school had been the host). ESPN personality Lee Corso dressed up as Penn's founder founding father Benjamin Franklin (who is also the namesake of Franklin Field) and predicted (correctly) that Penn would win the game. On November 7, 2015, Penn played archrival Princeton at Franklin Field in their Homecoming Game. In a hard fought contest that was tied 20–20 with four seconds left, Princeton had a FG blocked sending the game into overtime. In the OT Princeton converted a FG and Penn replied with a TD, winning the game, 26–23, keeping the Quakers in the Ivy League race. On November 14, 2015, Penn defeated 12th ranked Harvard 35-25 at Harvard Stadium. This win ended Harvard's 22-game winning streak; their first loss since October 26, 2013. With this win, Penn improved to 6–3, 5–1 in the Ivy League, and with a 34–21 win in their next and final game against Cornell, were able to clinch a share of the Ivy League title along with Harvard and Dartmouth. The title capped a remarkable comeback season for Penn. After back-to-back losing seasons in 2013 and 2014, Penn started the 2015 season at 1-3, including a loss in their Ivy League opener, but rallied with 6 straight wins to end the season. ↑ "2011 Fact Book Penn Football" (PDF). Retrieved October 18, 2011. ↑ "Logo & Branding Standards". University of Pennsylvania. Retrieved 2016-04-01. ↑ Caldwell, Dave. "Penn Loses in Overtime for 3rd Game in a Row". New York Times. Retrieved 2011-09-16.